“I was diagnosed with Plasmacytoma of the spine and Lymphoma in October 2015. My GP put me in touch with St Catherine’s Hospice to help me get advice on how to manage my illness. I was admitted to Beeches Ward in March 2016 and since then, the hospice have really helped. I thought I was going to die, but everyone here is very straightforward and encouraging. They controlled my pain with morphine and gave me other drugs to help with my nerve pain. My time staying on the ward went really quickly and all the staff get on so well. People think a hospice is just for people dying but St Catherine’s support you in any way they can. I was amazed at the range of therapies on offer, from arts and crafts to walking football! The staff make you feel important and it’s clear that people love their work. Sometimes when you get ill, you can feel lost in the system, but St Catherine’s treat you like a person – you’re somebody when you’re here. Everyone does an amazing job, and all my visitors were also really impressed. Even when I was discharged from the hospice doctors continued to visit me at home. They always have time to explain your illness, and having that expertise on hand is really reassuring. Staff from the hospice are in touch with me every two weeks to discuss how I’m doing and there’s continuity. To me, that’s something that’s very important and you don’t always get it elsewhere. 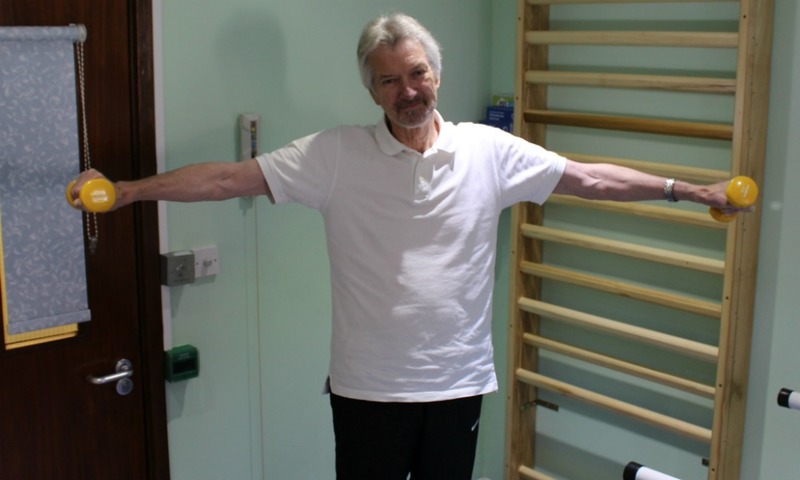 I also come to the hospice gym once a week to do physiotherapy with the Therapies Team. If I didn’t come here, I wouldn’t be doing any exercise and it’s like a safety net for me. I often think the hospice should be called St Bernard’s instead of St Catherine’s because it’s continually rescuing people and nurturing and supporting them.